The Somali youth face a daunting challenge in getting employment in their country. According to a UN report, 70% of the population in Somalia is under 30 years old and the youth unemployment rate is approximately 67%, which is the highest in the world. Every year, thousands of youth graduate from local universities without any foreseeable future for securing employment. Job prospects are dim and depressing. 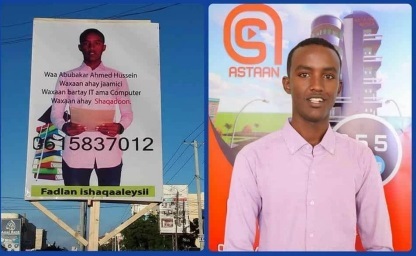 In the past few weeks, a phenomenon of a Somali young man, who posted his picture and contact information on a billboard in Mogadishu, went viral on social media. Abukar Ahmed Hussein graduated two years ago from a local university in Mogadishu with a degree in information technology. Ahmed has applied for numerous jobs for the past two years but to no avail. His billboard posting was a radical departure from how people normally look for work. Perhaps, it was a desperate attempt to be noticed from a crowded field of job seekers in a market stingy with employment opportunities. Whatever his motivation was or the odd technique he employed, it paid off. Hussein got job offers from several companies. What once was a stale, bleak job market suddenly opened up for him became promising and real. He finally settled for one: Astan TV. What saved the day for this young job seeker was a combination of several factors. First, he broke the traditional method of job application. Second, he was not afraid to try a new approach for applying for a job. Third, his message on social media propelled him to an unexpecting level—the attention of companies who otherwise would never have noticed him. 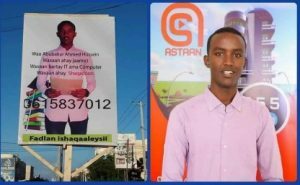 Unfortunately, Hussein’s story, while unique, is not the norm for many Somali youth. Lack of employment opportunities has forced thousands of youth to immigrate to Europe, risking their lives and leading some to perish in the high seas. The youth face an array of barriers—lack of quality education, work experience, relevant work-related skills, employability skills, and merit-based recruitment process. Somali universities do not prepare students for the job market. These institutions have no academic and career development centers and hence produce graduates who cannot write a simple resume and a cover letter. The federal government promised to create two thousand jobs for the youth, but it turned out to be nothing but an empty promise. Nepotism is still rampant in the government and the only way one can secure employment is through connection to elders, businessman and politicians. There is no merit-based system in the government that guarantees a fair employment opportunity for all and eliminates the middle person. The government should come up with a national Youth Employment Strategy that aims at creating decent jobs for young people to reach their full potential. The strategy should include skills development initiatives, placement mechanisms and youth entrepreneurship development. The private and public sector should create an internships program that provides training, mentoring, and coaching to recent graduates to get hands-on experience and facilitate their entry into meaningful employment. In a nutshell, Somali youth are valuable resource and both public and private sectors have responsibility to provide jobs to ensure the Somali youth are able to contribute to the development of their country. The exodus of youth to neighboring countries and Europe will continue until employment opportunities are created. An unemployed young is not only a burden on the society, but he/she poses security risk in a country like Somalia, which is still recovering from the aftermath of civil war. Moreover, the young people are the cornerstone in the development and the well-being of the country and therefore their employment issue must be tackled urgently.